The Dansko Taupe Milled Nubuck from the Embroidered Pro collection. 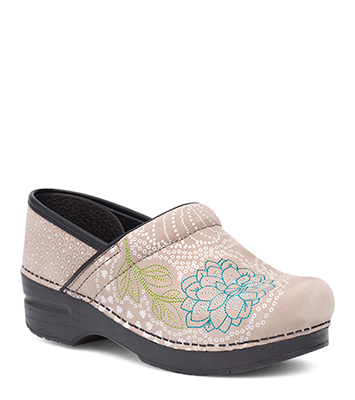 Embroidered Pro, a classic Stapled clog, features colorful, embroidered detailing around the collar, firm foot and arch support, optimal shock absorption and an anti-fatigue rocker bottom. Available in Scotchgard™ treated stain resistant nubuck leather uppers.